Doing a breakdown of Elliotte Friedman’s 31 Thoughts is hardly an original venture but it was something I did every now and then for Dave Davis and The Buffalo Star. In an attempt to get some more content on the site I thought I’d resurrect this feature here at 2ITB for your reading enjoyment. A primer, for those who may not be familiar with the practice: I’ll take a handful of topics from the most recent 31 Thoughts published by Sportsnet and offer up a few additional thoughts and opinions on the news of the week. The original text will be bold. If you haven’t read this week’s edition yet, you can find it here. On Burakovsky: The Capitals have asked for a couple of mid-to-high round draft picks in exchange (seconds and thirds would be a good get) for him. That would give them more flexibility and assets to chase what they need. Even with a seven-game losing streak, absolutely no one is writing them off. The Sabres haven’t been directly connected to Burakovsky yet but he’s better than at least five of Buffalo’s current wingers. If they plugged him into a top-six role, there’s reason to believe he’d surpass the production he’s had the last three years in Washington. He’d certainly be more effective than he’s been in Washington this year considering he’s struggled to crack the Capitals’ lineup. That he’s been unable to cement a regular spot is disconcerting. He’s a quality player with elite skill, someone I’ve personally been a fan of going back to his time with the Erie Otters. However, he’s bordering on project territory and that’s not something I’d be too keen on seeing the Sabres take on. Luckily the expected price on Burakovsky is pretty low. A second and a third round pick would be pretty affordable and it could dip lower if his production stays stagnant leading up to the deadline. If the Sabres could somehow leverage the Capitals to move Burakovsky for less than a 2nd and a 3rd (perhaps they’d like the added depth Nathan Beaulieu would offer along with a draft pick) I’d be very pleased with acquiring him. 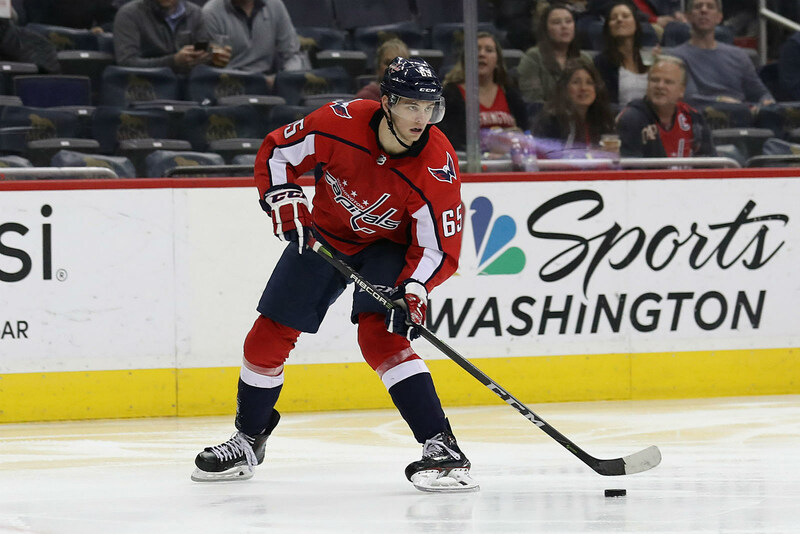 It’s a situation worth tracking as the opportunity to pair Burakovsky with a more aggressive deal to add young talent at center would represent a strong step towards remaining in the playoff conversation in 2018-19. The CHL/NHL Top Prospects Game Wednesday in Red Deer gave teams a choice the night before: either the similar CJHL event in Okotoks, Alta., or the Hurricanes/Flames in Calgary. The Maple Leafs chose Option B, but I don’t believe the scouting target was Dougie Hamilton. Process of elimination indicates Brett Pesce, but I can’t say it for sure. If Dubas chooses a left-handed option, the top target is Jake Muzzin. But he has made it clear to those who have asked that Kasperi Kapanen is a no-go and 2018 first-rounder Rasmus Sandin has similar status. Toronto’s pursuit of a defensemen could wind up as the hottest story of the deadline. There aren’t any marquee rentals, even if Matt Duchene is made available it’s not an overly impressive group. If Toronto opts to push hard for help on defense, it could wind up as one of the bigger, more impactful moves. The note on Pesce being favored over Hamilton makes a lot of sense to me. The Leafs are already dealing with fan unrest over an offensive-minded defenseman. I could see the franchise having some pause over bringing in another player of that ilk. Muzzin has been loosely linked to the Leafs for a while but I have a sneaking suspicion that the deal to come with be with the Canes. Cutting Kapanen and Sandin out of any deals leaves the Leafs to peddle picks and I’d assume Timothy Liljegren at the very least. I also wonder if William Nylander is offered up in these negotiations. It was thought that the Canes and Leafs discussed a swap for a defenseman and Nylander during the latter’s holdout, I could see a scenario where they loop back on that type of deal. As an aside, Friedman puts a few thoughts together on the contract status of Auston Matthews and Mitch Marner and while I’ve seen plenty of Sabres fans hoping one is signed to an offer sheet this summer. I have no expectation that either will sign with another club but the player I am fascinated with is Kapanen. He too is a restricted free agent and unless Nylander finds himself in another uniform, I wonder if Kapanen is the one without a chair when the music stops. I don’t know how Buffalo would ever get their QEW rivals to send him over the Peace Bridge but he’d certainly look great in blue and gold. And there’s still reason to believe the Leafs will explore other options that would allow Kapanen to stick around. The mystery of Sergei Bobrovsky’s future continues in Columbus. The Blue Jackets are wisely playing this very close to the vest, and there’s an understanding he will consider other situations — but has he actually committed to them on paper? One of the theories was that he and agent Paul Theofanous verbally considered some possibilities, but didn’t want to give Columbus an actual written list. Once you agree to that, the team has more control. It’s odd how murky things have gotten in Columbus. The Panarin and Bobrovsky situations are starting to dominate more and more press and they could potentially leave the Blue Jackets in a and way if they both leave on July 1. Bobrovsky’s no movement clause complicates things and the in-season goalie market is rarely hot. Fitting him in under the cap would be a massive undertaking, but San Jose is a team that could really benefit from renting Bobrovsky at the deadline. The Sharks would need to clear out upwards of $5m in additional cap space to get the job done and their lack of a first round pick this year and next makes that trade even harder to pull off. On the surface, plugging Bobrovsky in would likely elevate the Sharks’ league-worst save percentage and likely vault them to the top of the Western Conference standings. BSN Denver’s Adrian Dater reported that Rangers scouts consistently tailed the Avalanche over the last little while. Unless that’s about something Colorado would want the Rangers to take from their roster to facilitate, say, a Kevin Hayes trade, I don’t think New York’s primary interests would be at the NHL level. The obvious connection is Shane Bowers, who Rangers bench boss David Quinn coached at Boston University. But the Rangers will be seeking much more. The Avalanche will zealously protect their most appealing draft assets. Colorado, however, will see what Nikita Zadorov can return. Note 19 is included here simply because I’m sure it will perk up some ears around Sabres Nation. The Avs are in a tricky situation because they’ve backslid from the team they were last season but thanks to the parity in the West, they’re right in the thick of the playoff race. Hayes makes sense for the Avs if they’re truly in the rental market. He gives them another two-way center option which should help lighten the load on JT Compher. Perhaps even shifting the former Sabres pick to the wing. Namestnikov might be the better move of the two though. He’s always flirted with producing more and the Avs could use a little more juice on the wings behind Landeskog and Rantanen. I’m slightly surprised that Zadorov’s name is being put out there. He’s remained inconsistent through his career but the Avs defense isn’t exactly Murderers’ Row. I wonder if that’s not the area they try to shore up before the end of February. In addition to Valeri Nichushkin and Brett Ritchie, Dallas is also dangling Mattias Janmark. A couple of years ago, they felt his injuries removed sorely needed speed from the roster. Janmark scored 14 even-strength goals in 2015–16, and, after returning from injury, 13 more in 2017–18. He’s got just three in 49 games this season. He’s better than he’s shown. I’m really including this note to pat myself on he back for including Mattias Janmark on my list of players the Sabres might be able to pursue as a trade target. He’s not a world beater by any stretch and would only offer a limited improvement over most of Buffalo’s current roster. So really this is just my way of being arrogant about my very good GM skills. The best GM skills. My deals would be the very best. Deals you’ve never even heard of before. In the weeks after All-Star, the league will bring something new to the three iPad Pros on each NHL bench. Currently featuring real-time video highlights, what is called the SAP-NHL Coaching Insights App will be added to the system. These will be data-based, eliminating the wait for printed sheets for updates. Done in consultation with the teams and their coaches, each staff will be able to customize what they wish to see. Another thing the app can do is show faceoff results in each circle as opposed to each zone. “Our job is to put the information out there, and [teams] can decide what and how much to access,” he said. A little further down in the full version of 31 Thoughts, Friedman includes a note on when something like this would be made available to the public. While this particular function – the app and live stats – would be a nice addition to the current suite of in-game stats that are offered, I hope it points to something bigger from the league’s perspective. Eat the fly, eat the fly! We saw a couple of weeks back that puck and player tracking is here, on the verge of a full roll-out. That offers an opportunity for a new way for fans to consume the game. These live stats are yet another. The one product I’m still waiting to see the NHL introduce is their version of All-22. Hockey is a lot different than football. For one, there’s not an overwhelming demand or use of coach’s footage of the entire ice like you get with football. However, the proliferation of GIFable highlights and other interactive combinations with advanced stats leads me to believe that some sort of Gamecenter add-on could be a terrific niche product. I think of something that would give fans access to every camera angle during the game, perhaps even the introduction of a high-angle “coach” camera. It would open the door for fans to tap into home and away replays of goals, saves and hits. Various content creators would have the ability to hone in on specific points in the games and break things down via multiple angles. Think goalie gurus pouring over game footage or prospect experts getting a pile of extra game action to analyze as young players get inserted into the lineup. I know I’d love to have that type of access at my fingertips. I’d pay at least $9 dollars for it.